In the US, 2,500 people die and 12,500 are injured in house fires every year. The average number of house fires you can expect to encounter in your lifetime is 5. You are much more likely to encounter a house fire than not to. Although most are small, one in four of those fires are reportable with the potential for serious injury and damage. House fire property damage is ridiculously expensive- estimated at $7.3 billion every year. That's almost a billion MREs! The main thing to take away from this is that most fires could have been prevented. Prevention is Key: If you are a smoker, stay aware of your butts. Make sure they are out before you dispose of them. If you are a chef, or like to pretend like one, make sure you watch your stove top and oven. Kitchen fires are the most common house fire. Small appliances, space heaters, fireplaces, and mischievous children are also prime suspects for causing fires. Stay Alert: I know, fire alarms, carbon monoxide alarms- they always beep their first 'battery low' beep in the middle of the night. And if you have two close to each other - good luck figuring out which one is dying its slow death. But they save lives. It has been proven. Keep your alarms working and juiced up with backup batteries. If I gave you a 3 minute heads up that someone was coming to kick in your door to burglarize your home, would you appreciate it? I know I would be prepared and loaded to go! The average escape time once an alarm is going off is three minutes. Not enough time to gather everything you own, but enough to get your loved ones and Bug Out Bag out. Fire Spreads Quickly: Fire is fast, and most modern houses are just filled with fuel for fires. Fire can spread very quickly so you need to be sure to be quick on your feet and in your reactions. Smoke is three times more likely to kill you in a house fire than burns, so keep low if needed to avoid too much smoke inhalation. Extinguish the Threat: If you don't have a fire extinguisher, you should get one. If you have one, or when you get one put it in a logical place, like under the sink or near the stove top. Let everyone know where you are keeping it that lives in the house. When you have a guest at your house cooking, be sure to mention where the extinguisher is. It makes for a pretty good joke if you let them know you believe their cooking has a chance to burn your house down without one. 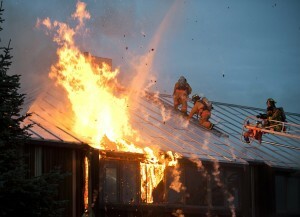 House Fires are commonplace and have a wide range of incident severity. A house fire can span between a small kitchen fire to losing your home and having injuries or even deaths. A small fire can easily progress into a large fire, which sets a fire’s potential danger a little higher than a typical emergency. The severity of almost any unchecked fire is very high, but we are able to extinguish fires and control them with enough forethought and planning. A single house fire may seem like a big deal, especially if it is your house, but it will not cause the end of society- or the end of the world. House fires will become much more common in a SHTF scenario due to looters, arsonists, and the fire department being disbanded. This highlights a huge vulnerability of bugging in, and the need to be able to bug out at a moment’s notice- especially in the event of a societal collapse. 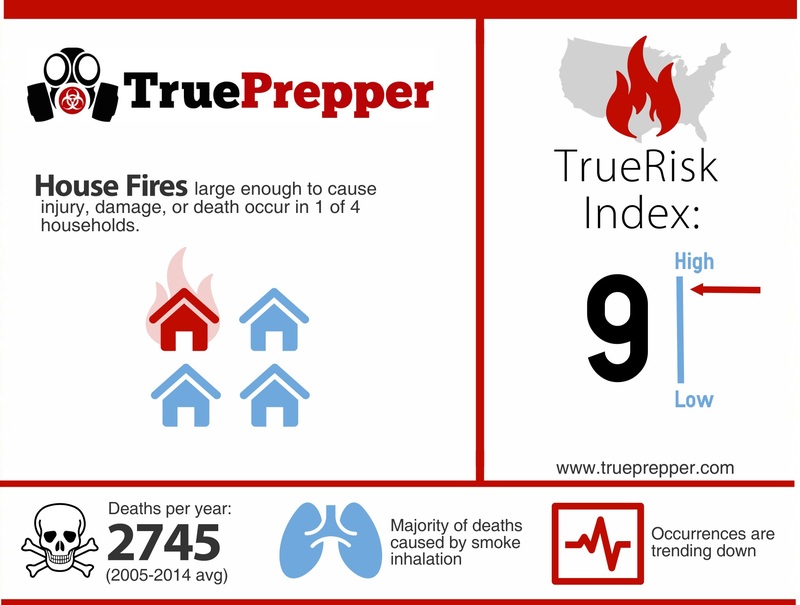 A house fire rocks the scale with a 9 on the TrueRisk index. That is the highest risk we measure, and it can be attributed due to the high chance of occurring and the destructive potential of a fire. The ability for fires to often show up when other disasters are occurring increases their danger even more, since they often can be the result of a ‘domino effect’ with disasters. A ‘domino effect’ disaster is a disaster that follows other disasters, much like house fires often follow earthquakes. The chaotic nature of other disasters makes you much more likely to encounter fires. While geography and other factors can affect your house fire risk slightly, you’re building type and weather conditions do more to change your risk. Dry weather- whether typical or uncharacteristic, can slightly increase the chance of a house fire. Buildings without firewalls are much more likely to burn quickly, making them more dangerous as well. Not having firefighting equipment actually also increases your risk, since a fire that could be controlled would go into an uncontrolled blaze without any equipment to suppress it. With most emergencies, we will stress the importance of plans and practice. Both of those are important for fires as well, but equipment is a priority here. If you have limited funds for preparedness, preparing for a fire should be at the top of your list (quickly followed by security). Installing smoke detectors, carbon monoxide detectors, and fire extinguishers in your house should be one of the first things you accomplish when you move. Check on them every six months to be sure they are operational. Be sure to practice, and have everyone in your home know how to operate a fire extinguisher. Prepping for a house fire is very important, because you often do not have much advanced notice. When the fire alarm goes off, each and every person in your house should be able to spring into action and know what to do. If you are being alerted from the fire alarm, you should be evacuating your house as safely as possible. Shout to alert everyone in the house. Check door handles with the back of your hand to avoid burning your palm. Cover your face from smoke and get low to avoid it, if needed. Smoke rises- so upstairs areas and higher up in rooms and hallways will have more smoke. Smoke inhalation is the number one killer from house fires. Sometimes people escape fires just to succumb to their smoke inhalation injuries if they do not receive medical treatment immediately. If first responders have not been contacted by the time you escape, call them immediately with details on your location. If you are lucky enough to have no injuries from a fire, you will need to count your blessings quick because you need to get back to work. First responders will need information, your family will need to be accounted for and comforted, and insurance adjusters will need to be contacted. It can take a long time to rebuild a home, so concentrate on the things that matter first, such as your family and your own well-being. If the house is just damaged you may still need to make arrangements due to the smoke contamination. Disaster cleaning services specialize in this type of work, but be careful of cash-only deals or uninsured work- especially if the fire was a ‘domino’ disaster. Many people chase disasters to make a profit, so it is best to be careful if your fire was connected to a disaster in any way.